de Fuego Grille and Whiskey Bar Coming Soon Follow us on Instagram and Facebook. Open daily, Sam’s Restaurant and Lounge are local favorites. In addition to our standard superb menu choices, our Chef creates seasonal specials for lunch and dinner, including desserts! The Monarch Sunday Brunch is a popular with the locals and guest travelers alike featuring a chef attended carving station, specially prepared omelettes and a wonderful assortment of desserts. Sam’s Wine List An enjoyable selection of Wines, Champagne and Sparkling Wines. Room Service is available during usual restaurant hours. Catering Off-premise catering is available for your special events. 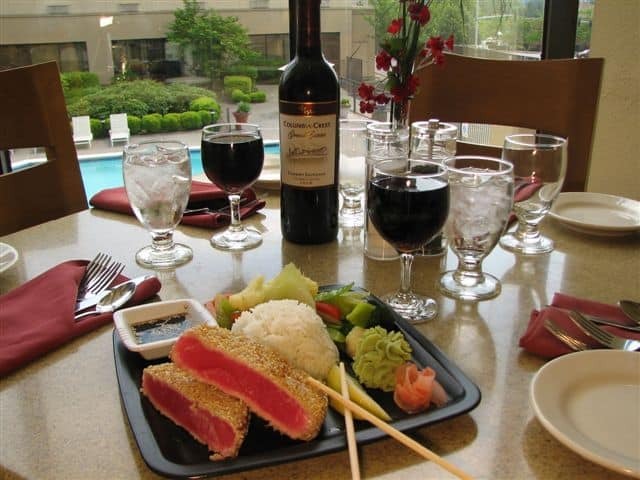 For more information call our catering department 503-652-1515.